After a weeks-long review process, IMAN is excited to announce the dynamic selections to its first Artist Roster. Thirty-five skilled artists from across the country and specializing in many different forms of expression will spend the year becoming well-versed in IMAN’s core principles. Through this training, IMAN artists will more effectively situate their work at the intersection of spiritual culture, social justice and community organizing. A select few members of the IMAN Artist Roster were chosen for the Sacred Cypher Creatives cohort. This group of 5 will enjoy a yearlong opportunity to work closely with IMAN’s initiatives, contribute to programs and campaigns, and access additional support for artistic projects. Congratulations to Kelly Crosby, Al Taw’am, Kayem, Phenom and Liza Garza on becoming Sacred Cypher Creatives! Since its inception, IMAN has invested in the careers of artists by building collaborative relationships. We have looked to artists as decision-makers on our project committees, board of directors, and in building community through our Artist Retreats. The launch of IMAN’s Artist Roster uplifts these priceless relationships, and is fundamental to our work in organizing for social change and fostering health, wellness and healing. Visit www.imanartistroster.org to learn more about all the members of IMAN’s Artist Roster, and be sure to follow us on social media for the latest IMAN Arts & Culture updates. 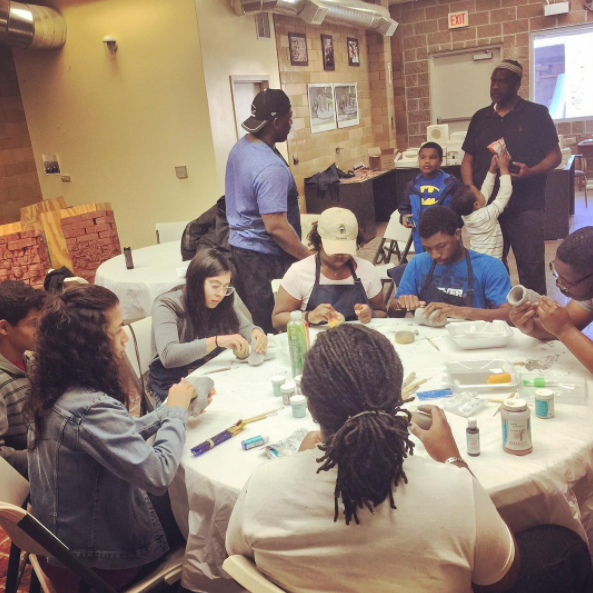 During the soul-soothing days of Ramadan, IMAN’s resident art instructors hosted a special weeklong class called “Illuminations: Fasting & Ceramic Art” inside the Beloved Community Studio. The intimate seminar explored the spiritual benefits of fasting across various spiritual and cultural traditions, while teaching basic ceramics techniques like molding, painting, glazing and positive/negative space. The ‘Illuminations’ class was led by Mariana Lopez—a healing practitioner and soon-to-be licensed art therapist—and Khalid Partee—the current Green ReEntry instructor who discovered the restorative power of ceramics while incarcerated. They curated a rejuvenating safe space for dozens of residents from some of Chicago’s most vulnerable communities, helping each student tap into their creative potential and produce incredible pieces of art. In the coming months, we hope to further transform the Ceramic Arts Studio into the first full-time facility of its kind in the larger Marquette Park area. 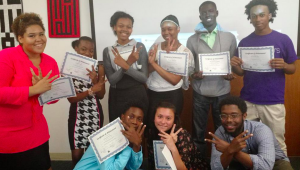 This project is poised to affect over 750 individuals through a multitude of projects, classes and unique workshops. Be sure to follow IMAN on Facebook, Instagram and Twitter to check out some of the beautiful artwork coming out of the studio! This month, IMAN kicked off its 2015 Fresh Expressions series with ‘Legacy X’. February 21st marked the 50th year since the assassination of Malcolm X (El-Hajj Malik El-Shabazz). To honor his legacy and continue to engage with Malcolm’s principles of self-efficacy, human equality and dignity, IMAN hosted several local artists known for messages of love and justice. Rappers Ahlei of the Kuumba Lynx collective and Inky each kicked rhymes about struggle and unity, while K-Love’s powerful poetry had the audience calling for (and getting) an encore. In between performances, Green ReEntry leader Rashid Grant reenacted the famous “Ballot or the Bullet” speech. Attendees also enjoyed healthy snacks, drinks and fresh sandwiches, as well as free giveaways like Malcolm X buttons and a mixtape of Malcolm’s speeches. Fresh Expressions is a community-led, safe, creative and artistic space that provides a platform for local artists and offers residents of all ages the opportunity to have fun, learn, foster relationships and build power. Join us for the next Fresh Expressions on Thursday, March 26th from 6-8pm at the IMAN Youth & Arts Wellness Center!